It’s been a long hot Summer…. This weekend was awesome. The Death show went really well. I looked like a gangster. Benjamin looked like himself. Scandals were made and wine flowed like white water. Last night was TERRIFIC! The models looked incredible and the tunes were off the chain. Made some new friends and (we hope) new enemies. There’s plenty of photos & videos out there on the web, should you want to see a girl from “Make Me A Supermodel” painted up all fancy-like. I even got out in time to catch Awesome Color play some sweet neo-psych at The End. As Summer starts to wind down, we have one last night of hot, sweaty dancing to do. We have TWO hot jams for you this weekend. August 8th we will be spinning the hits at Bad Apple (427 Chestnut Ave.
Nashville, TN) THE BIG ONE after party starts @ 9PM. Wine will flow. And gangster attire required. The 9th we will be at Blackbird (2306 12th Ave S, Nashville TN) for BODY OF ART, a live model installation exhibit. All procesed from BODY OF ART will go to Nashville Cares. Come out and have some fun. 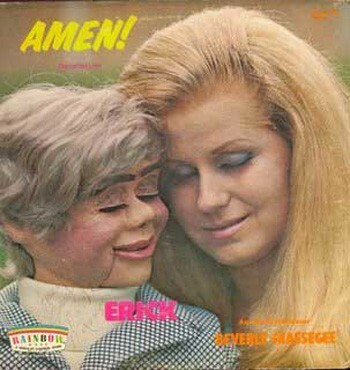 In other news, we have found (thanks to MArvel Comics’ blogger Agent M) the creepiest LP cover ever. And if you’re in The Big Apple, check out http://www.biggayicecreamtruck.com – It’s like East Nashville’s taco truck, but colder and gayer. Last month’s Blackbird grand opening party went off like fireworks. Tons of people came out to see Zach’s art, get tattooed, eat burgers, check out some incredible hair/make up, and listen to us spin every song Barry Gordy has ever made a dime on. It was a good time for all. 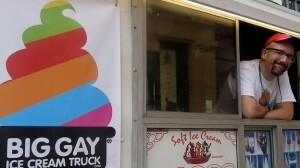 A terrific way to kick off a great new spot for art and spark the fuse for Summer ’09. 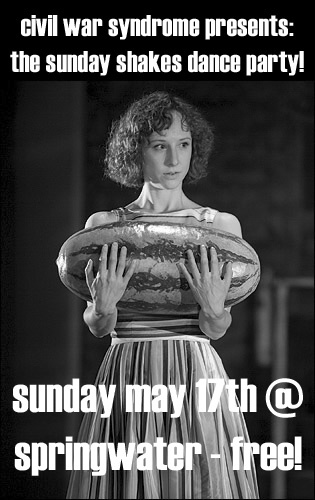 Next Sunday – June 7th – they will be having another hot jam. My buddy E.J. will be having an opening for his one man photography show. Pin up girls smoking fags and blowing out the exhaust. Sizzle all the way. To roll with the theme, Nashville’s derby girls will be on skates selling smokes – just like old time cigarette girls. Since we never want to be left out of a good time, Benjamin & I will be back on the turntables. The party goes on from 6pm ‘til 10pm and you know you don’t want to miss it. In other news, two bands I know & love have been pumping out a 7” a piece in the past 2 weeks. Nashville’s new rockers Heavy Cream just released their debut on Infinity Cat. Five lo-fi tracks of stripped-down twangy punk. Go see them. They’re a blast live. While you’re there, pick up this slab of grey-swirl vinyl for your collection. The other record is a single from Turbo Fruits, so you know you are in for a good one. It’s the first recording with the new line-up and I think it’s their best yet. The A-side is a chorus-heavy tune about frying your brain. It reminds me a lot of Wreckless Eric. The B-side is another winner. I look forward to more from these kids. This Fat Possum Release makes up for having to drop $10 on the King Khan & BBQ 7″ with only two tracks. Sunday was a BLAST!! I think we played every song Barry Gordy ever signed his name on. Blackbird looks great. Awesome things are going to happen with that place, so keep them in mind for your art and tattoo needs. Camera Obscura will be playing their sound-layered style of Scottish pop at Mercy Lounge tonight. Be there. Ratt will be rocking Municipal later on this week. Gonerfest 6 is coming up at the end of summer. They’ve posted some of the line-up. Along with the usual suspects, there will be performances by THE CLEAN and CHEATER SLICKS! 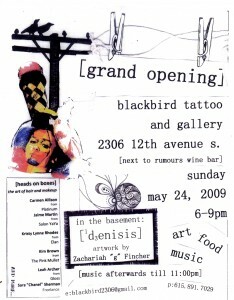 Blackbird Tattoo & Gallery Grand Opening!! Benjamin, Noah & I are spinning records all day & all night. Hot hits. Hot ladies. Hot weather? The grand opening celebration, taking place Sunday, May 24, 2009 will consist of two art openings, an open house of the new facility, food and music from 6-9pm. The Main Gallery will host a one night only a show, Entitled “Heads on Boxes,” and will feature the artwork of Nashville’s most progressive hair and makeup stylists, displayed on live models in the gallery. Participating stylists include Kim Brown at The Pink Mullet, Kristy Lynne Rhodes at ELAN, Leah Archer at Gloss, Sarah ‘Chanel’ Sherman a freelance artist, Charity Daw at MAC, Calli Devaney at the Chop Shop, Rosie Shulick at Suite One, Alicia at MAC, and Jenny a freelance artist. The Basement Series will house a graffiti, mixed media installation Entitled [1d3enisis] by local artist Zachariah “g” Fincher. Music on the front porch will continue after the art openings until 11pm. Last night was killer. Turbo Fruits, Kintaro, Jeff the brotherhood and Heavy Cream played a house party for Deli Magazine. Killer sets by everyone involved. Kintaro is my favorite new band in Nashville from the past year. Buy their 7″ on Baby Don’t Records. Its four tracks of power pop/punk for fans of The Replacements and Crimp Shrine. Everyone had a blast til some bros jumped a hippie and started a brawl, similar to any cheesy western saloon melee. Bummer. The Sunday Shakes has been going well. The cold weather should be over by the time we get around to the next one. If you look at the flier to the left, you will see that the next one is an Ides of March party. Get down. Jenna will be spinning her hottest hit singles along with your two horrible hosts. Joel promises to wear a toga behind the bar all night. This month’s Maximum RocknRoll is “The Health Issue” – essentially the conclusion is that you cannot be both punk and healthy. We’ve made our choices, evidently. It’s full of health stuff and “Best of 2008″ top ten lists. The best punk record of 2008 is concluded to be the first Die Kreuzen LP, from 1984. OK, boys & girls – the jams are hot and the internet is helping. Yeah, as nerdy as it is, you’re using it right now. Question our street cred if you want, but I believe that the internet could be an important information tool in the the coming years. We are here to ride that wave into future. We watched the guy from Black Eyed Peas on the TV-hologram-thing from Obama’s election night. This week I’ve watched two Woody Allen films and every episode of The Office: Season 4 on Netflix online. Now I’m on episode 8 of the first Season of 30 Rock, (How have I never watched this before?) so you should all know that the technology can be our friend. 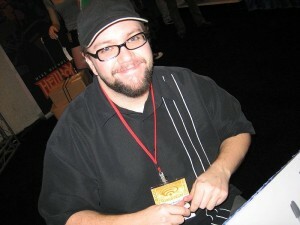 Even the His Hero is Gone dudes all have websites now. Here’s our new ways of keeping in contact via networking websites. We have a Facebook Group for The Sunday Shakes. 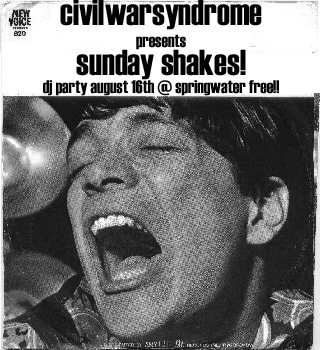 We also have Myspace pages for The Sunday Shakes and Civil War Syndrome Records. Those are some new high tech ways to keep in on whats going on. That should hold us off til we get flying cars an time machines. Well, it’s been a while. The LP is out and we have been pushing it an anyone’s face that will listen. Reviews are coming in. So far, so good. The Outlaw Lovers are bustin’ humps on their end too. In other news, Benjamin & I will be throwing a monthly jam at Springwater every third Sunday night. “The Sunday Shakes” starts with the first ever CIVIL WAR SYNDROME CHRISTMAS BASH. Every month we will be spinning punk, soul, garage, funk, and whatever else we feel along side our favorite local DJs. Cheap beer and hot tunes. If you havent seen it, here’s IGN’s Top 10 Doom Metal Bands. It’s got all the obvious picks. I can’t give a thumbs up to the Type-o-Negative call. And I don’t really think of Trouble as doom metal (just really awesome metal. Otherwise its a hot jam with some sweet videos for the handlebar-mustached-fuzz-box-lover in all of us. Nashville’s young crust wizards Karoshi have everything in the works for thier first seven inch EP. If you’re into dark, melodic punk, this shoud be your cup of tea. Think of bands like Remains of the Day, From Ashes Rise, Rudmentary Peni & The Ex. They have some songs online, if you want to hear it.